I can restore the soffit damage for $920, or replace it with vinyl for $6,000. Will the $6,000 investment increase the value of my home? A vintage home will always have maintenance and repair issues. There are many variables to consider with this question. Read on. Reader Question: I have a mid-century, brick, two bedrooms, and two-bath vintage home in a nice older neighborhood. Paid $215K for it and did some remodeling. The last appraisal was $236K. The soffit is very wide (4′ or so) and is part of the architectural design of the house. I have four spots that need repair for a quote of about $920 (plywood and paint). 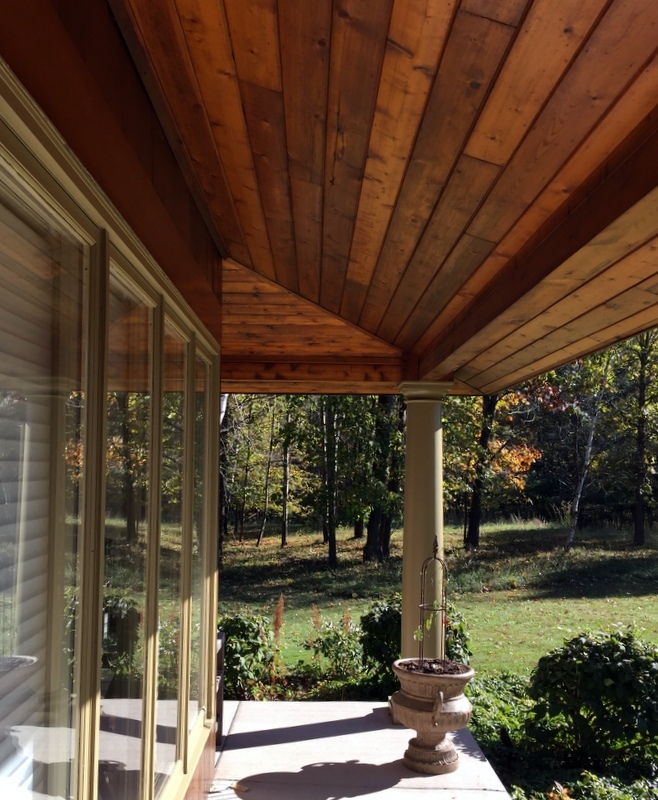 I looked into vinyl soffit and fascia and got a quote for a little over $6,000. The proposal includes archways front and back, window tops, garage door facing, etc. My question is two-fold: 1) Will a good quality vinyl soffit and fascia add value to my home?) Is it wise to spend six thousand dollars as an investment in the house, which is in excellent shape? Or should I keep doing patch repair as needed? Thanks for any light you can shed. Beth C.
Monty’s Answer: A vintage home that sounds like a very attractive and practical home is a joy. There are two different philosophies to apply to the questions you ask. Philosophy A: The purist. While your home is not yet of the age to be considered vintage or even historical, the architecture itself may be an example of times past that predate the actual age of the home. As it ages, your home comes closer to being considered worthy of preservation. The purist would be dissuaded if the original components were removed or covered over. Here is a preservation article suggesting not applying vinyl. Philosophy B: The pragmatist. Ultimately, coating the soffit and fascia with vinyl will eliminate future expense on an architectural feature of the home. The appearance may improve if the actual application is indeed a high-quality product and installed to the manufacturer’s specifications. How long do you plan on living in the home? Are there other improvements with which six thousand dollars could make a larger impact (the roof – as an example)? Did you buy the home as an investment or a place to live and call home? Are your finances such that the money will not have an impact on you? When you bought the home, do you believe that the purchase price represented a price at or below the low end of the home’s range of value or do you feel it was a premium at the top of the range of value? If you bought the home to flip it, or you will be there for less than five years and the goal is to make the home a good investment, then consider the nine hundred dollar repair. If you bought the home because you have no plans for the foreseeable future to relocate, and you love your job and it is secure, then the convenience of not have the expense of maintaining it with paint and possibly more replacement work becomes more valuable to you. If you are relocated and decide to sell, when the home goes on the market, some buyers would not even notice the soffit and fascia. They will be looking at the kitchen, the bathrooms and how far they must travel to work. Be cautious about various articles, particularly in magazines devoted to home ownership that print lists that are predicting a percentage value increase to certain types of homes improvements. It is difficult to predict unequivocally the outcome and measure it conclusively either way. The answers to the questions posed to you above that you do know the answers to might sway you one way or another. You did not ask, but consider this article about choosing a contractor at https://dearmonty.com/strategies-choosing-general-contractor, and seeking two more opinions as to cost and choices of material if you decide to move forward with the vinyl work. Also, consider reviewing similar installations of this product that have been in place for several years to see if the product has stood the test of time. Another consideration would be a contractor assessment as to the likelihood of similar failures of the fascia on other parts of the house in the future. The fascia under the eave is protected from the elements more than any other exterior feature. Can the cause of the four spots repeat in other sections? What is the likelihood of that happening?